Will a naturalized outdoor learning environment attract bees and other stinging insects? The short answer is “yes” if it contains flowering, nectar-producing plants. Any vegetated area provides habitat for animal life. Most animal species are beneficial players in the great web of life that human life depends on. This is certainly true of bees, which we depend on for pollination (with several other insect species). 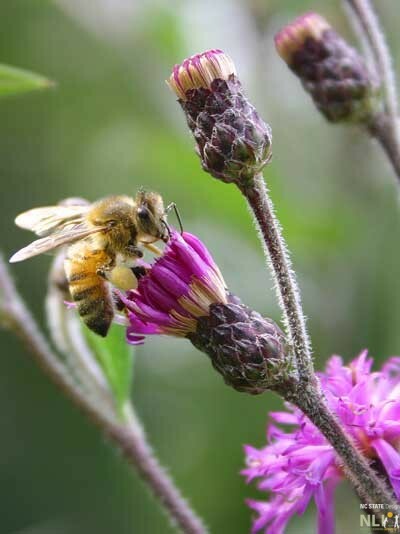 Bees and other pollinators are attracted to the pollen and nectar provided by flowering plants. Bees can sting, but most pollinators can not (butterflies, for example). As pollinators visit flowers to gather pollen and nectar, they transfer pollen to the female parts of the flower. When large numbers of pollen grains are transferred, more seeds develop and larger fruit is produced. Without pollination seeds and fruit will not develop. 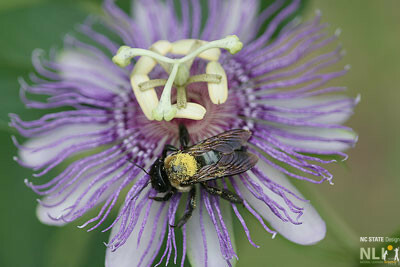 Pollination is essential to fruit production. Very few other stinging insects are attracted by flowering plants. Bees are especially efficient insect pollinators because they eat pollen and nectar exclusively. They visit many flowers of the same species during a single trip, and have hairy bodies which easily pick up pollen grains. Amongst other things, bees will pollinate apples, blueberries, cranberries, cucumbers, kiwis, melons, pears, plums, and squash. Yellow jackets, hornets, and paper wasps are all members of the wasp family, which includes many different species. Wasps have slick bodies and are not efficient pollinators. Wasps are useful, however, for pest control as they prey on harmful insects and feed them to their larvae. Wasps are attracted to sugary drinks, decomposing fruit and food cooking outdoors. These insects are generally not aggressive unless they or their nests are threatened. Nests can be located underground, hanging from trees, or under protected areas, such as the eaves of a building. ProtectPollinators.org administered by Debbie Roos, Chatham County Center, North Carolina Cooperative Extension, is a great resource for information on insect pollinators. Be sure to check out the link to Chatham Mills Pollinator Paradise Demonstration Garden with weekly updates of what is in bloom, plus so much more. University of Georgia Honey Bee Program website. This page is specific to insect pollination, but the site contains a wealth of information on insect pollination, keeping bees, etc.